Interested in optics, photonics, energy, and imaging? Focus in on the Ross Pendergraft Library’s newest database trial: SPIE Digital Library. This database includes over 465,000 papers spanning biomedicine, communications, sensors, defense and security, manufacturing, energy, and imaging. The most extensive research database available on optics and photonics, the SPIE Digital Library includes full-text access to not only peer-reviewed journal articles, but also technical papers, conference proceedings, and ebooks. Coverage extends from 1962 to the present. Unlike other scholarly article databases at RPL, SPIE also includes conference presentations—actual videos and presentation slides of the speaker. The SPIE Digital Library includes 8,000 conference presentations, including many plenary and keynote presentations. Users of the SPIE Digital Library will find many of the familiar options that other databases provide like Advanced Search and ways to limit search results by year, type of publication, keywords, author, or affiliation. 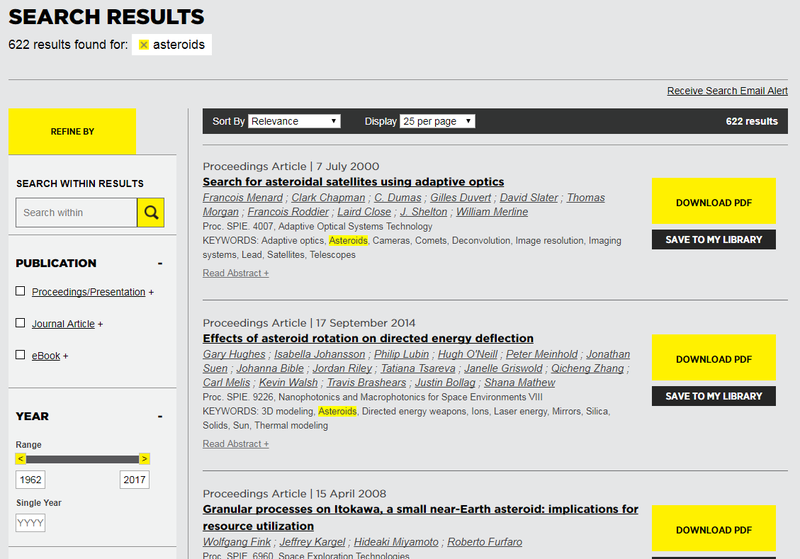 SPIE also offers clear tools to get citations into Refworks or another bibliographic reference manager. Unfortunately, there is no direct connection to Refworks at this time, so you will have to download the citation and then import the reference manually. You can also share the article via email, Facebook, and other social media platforms. Just remember—this resource is only available to students, faculty, and staff at Arkansas Tech. Take the SPIE Digital Library for a spin from now until December 18th, 2017. If you like what you see with this resource, send us a message at Ask Us or alert the library liaison for your department. Remember, we rely on your feedback to make future database purchasing decisions, so please drop us a line.